If merry old St. Nick came by your place last night, you may have heard the tap-tap-tapping of reindeer hooves on your roof. Since Mr. Claus tends to grab all the attention this time of year, I thought I'd offer some little-known facts about his tireless team of tiny reindeer. Reindeer (Rangifer tarandus), of which there are 14 subspecies, belong to the Cervidae family, which includes deer, elk, moose and wapiti. All members of the Cervidae family have antlers, hooves and long legs. Reindeer are the only species of deer in which both males and females have antlers, and they grow a new set every year. A male reindeer's antlers can grow up to 51 inches long and weigh up to 33 pounds; a female's can grow up to 20 inches. 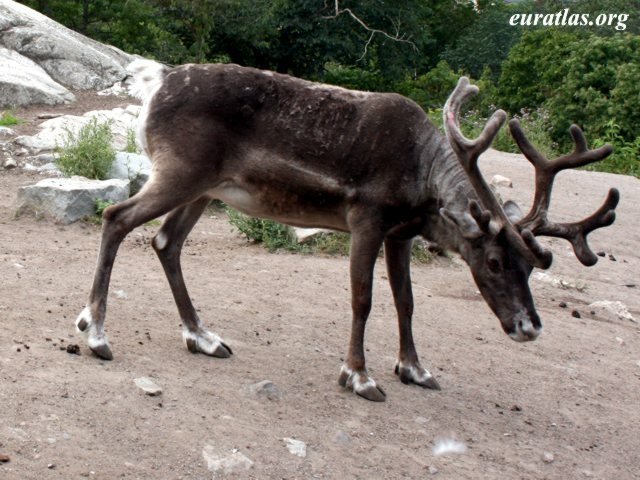 Reindeer body size varies quite a bit depending on the subspecies. Males range from 28 to 53 inches tall at the shoulder, from 5.9 to 6.8 feet long, and weigh anywhere from 143 to 529 pounds. Females are smaller at around 5.5 to 6.2 feet long, and 121 to 308 pounds.2 The largest reindeer subspecies is the Finnish forest reindeer, who measures nearly 8 feet in length, nose to tail. Reindeer can be found in Alaska, Canada, Greenland, northern Europe and northern Asia in tundra, mountains and woodland habitats. Their home ranges can cover up to 200 square miles.5 Reindeer are uniquely equipped to live on the frozen tundra. Their noses serve as little heaters, warming the air they breathe before it enters their lungs. The nose also condenses water in the air to keep mucous membranes moist. Reindeer are social creatures that live in herds numbering from 10 individuals, to a few hundred, to a few hundred thousand in the spring!10 They eat, sleep and travel together in herds. Baby reindeer, called calves, are born after about 7 1/2 months of gestation, and weigh from 5 to 20 pounds depending on the subspecies. The little guys and girls stand up within an hour of being born, and within a week are eating solid food to supplement their mother's milk. Reindeer typically cover from 12 to 34 miles a day during migration and run at speeds of up to 50 miles per hour. Even day-old calves can outrun an Olympic sprinter!